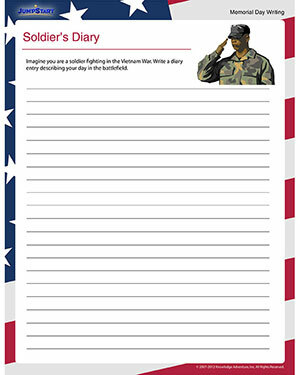 JumpStart’s ‘Soldier’s Diary’ is a fun writing activity to help fifth graders learn more about the terms and concepts in use during the Vietnam War and use them in their writing. Apart from being an exercise in creative writing, this free and printable writing worksheet also helps kids brush up their knowledge of history. Make this Memorial Day special. Help your kids transport themselves to the era by reading to them about the Vietnam War or showing videos. Then, leave them to their imaginations as they assume themselves to be a soldier fighting in the war and write a diary entry for him.